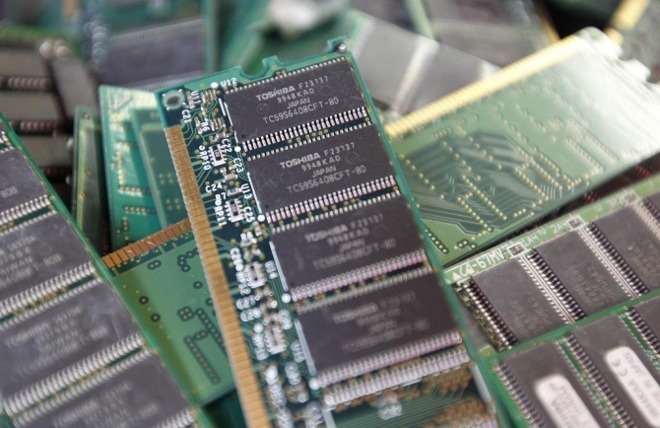 The Japanese government is preparing to vet the security of potential bidders for a majority stake in Toshiba's memory business —something that could give U.S. companies an edge, but stop Apple suppliers Foxconn and TSMC, a report said on Friday. The government would invoke the country's foreign exchange and trade laws to control the auction in the name of national security if necessary, one of several sources explained to Reuters. Another source suggested that the U.S. is the "only feasible partner from Japan's national security standpoint." A Toshiba executive commented that it's "obvious" U.S. bidders are more suitable, as the company will probably have to fight with the U.S. government over its nuclear unit —Westinghouse —and might be able to cooperate in a chip deal to ease the situation. Toshiba is selling control of its memory business largely because of Westinghouse, which is facing a $6.3 billion writedown its parent company can't afford. Westinghouse is in fact exploring the possibility of a Chapter 11 bankruptcy. Earlier this week, a report said that Foxconn and TSMC are not only ready to bid for the memory unit but partnering up. That would likely solidify orders with Apple, since the company could turn to the pair for processors, displays, memory, and assembly, possibly at lower costs. Rejecting non-U.S. businesses would also toss out Korean memory maker SK Hynix, another Apple supplier. It might however help fellow bidder and Apple supplier Micron. Other reported American bidders include the likes of Bain Capital, and Western Digital, best known for its hard drives. Apple itself has been labeled a candidate, but would be unlikely to bid on its own given the cost and complexity of entering the memory business and dealing with outside clients. The Japanese government has only rarely invoked national security to block foreign investments, one example being in 2011, when it halted bids on camera maker Olympus since its optical equipment is used in military hardware.